Imagine it: the year is 2024. You are in an arena. Your 2D battlefield sprawls before you, and on the other side, your enemy stands, poised for victory. Surrounding you, the audience gasps. Your blade whirls in the air and returns a nigh impossible save. Your opponent serves the ball, and you rush in for a miraculous win. It was a long road and looking back, you know you wouldn’t have made it without your trusty racket. Now. Let’s rewind to the present day. You have outgrown your beginner paddle and are ready to up your game. But which paddle do you choose? Read on to see if the Stiga Pro Carbon is the racket for the job. Ready for the Stiga Pro Carbon? In the hands of an intermediate player, the Stiga Pro Carbon table tennis racket is ideal for climbing the rungs from garage hobbyist to weekend warrior supreme. The larger-than-average sweet spot makes this well-rounded bat easy to handle for relative novices looking to hone their skills. But this is also where the racket’s versatility shines. The same sweet spot that makes this paddle easy to use for intermediate players, coupled with its immense spin, power, and speed make this blade a powerful weapon in the hands of an advanced offensive player who is capable of controlling their shots. Offensive players who enjoy smashing and looping will get the most out of what this blade has to offer. Defensive players who rely on finessing their spin to win will have a hard time controlling the ball with this table tennis racket. Stiga puts the bat’s spin rating at 100, but when you add in the vast amount of power the racket produces, ball control goes right out the window. People who enjoy using techniques like backspin and chopping will be sorely disappointed. For them the right choice would be Killerspin JET 800 or STIGA Evolution. It is also important to note that the Concave Pro handle designed for the Pro Carbon is not intended for Penholders. The handle is a shakehand design. Stiga stands at the top of the short list of table tennis racket developers. Their innovative team researches the ever-growing needs of the ping pong professional and develops new tech to take them to the next level. With over 60 years of experience under Stiga’s belt, you can trust in the products they deliver. WRB stands for Weight Balance, Rate of Recovery and Ball Sensitivity. Stiga placed a metal rod through the center of the club’s handle. While the heaviness of the handle does offset the extreme lightness of the blade, but you will need to adjust to the weighty design. Once you have a handle on the weight, the extra mass provided by the heavier handle will give you enough paddle bulk to have balls flying back to your opponent at lightning fast speeds. Most blade manufacturers use your everyday, run of the mill lacquers to coat their rackets. Stiga uses Crystal Technology to apply a hydrophilic gel lacquer. Hydrophilic gels harden the surface of the paddle to make it even faster. Stiga uses a combination of nanotechnology and carbon-based glue to assemble the racket. The potent recipe means the Stiga Pro Carbon table tennis racket is low in the flexibility department. The rigid design helps increase speed but also prevents the blade from absorbing a lot of the ball’s energy. 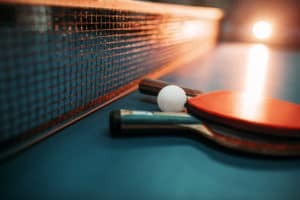 So the NTC technology is a bit of a double-edged sword as it is also part of the reason the ball loses some control when it hits the table tennis table. The rubbers that cover the blade of this formidable club use ACS technology. Built for additional speed and power, the 2.00-millimeter pad of rubber produces a catapult effect to, once again, increase speed and power. Even still, the ACS technology lends elasticity to the rubber that allows it to regain some of the control lost from the other speed focused features. While the handle is more substantial than those of your average racket, the blade itself is light as ever. This lightness stems from Stiga’s use of Balsa wood. The paddle consists of seven layers in total, five of which are lightweight balsa wood and two of which are carbon. The carbon baked into the design combines with specialized treatments to create a larger sweet spot than that of most paddles. 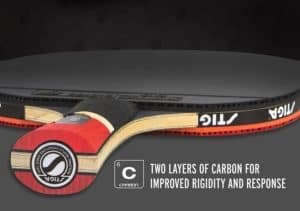 The Stiga Pro Carbon table tennis racket is a great way to improve your game if you have outgrown your current paddle. Due to its weight, the Pro Carbon is an excellent choice for anyone who wants to enhance their offensive game. The heavier weight makes it easier to learn looping and smashing techniques so when you do use a lighter paddle you can be more versatile in your play style. What this racket lacks in control and finesse, it more than makes up for in power, spin and speed. It is enough to give any opponent a run for their money when they issue you a challenge from across a ping pong table. 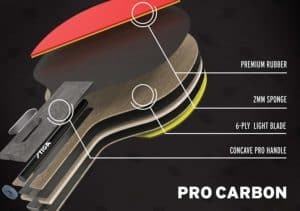 If after reading this review, you do not feel like the Stiga Pro Carbon is the right blade for you, check out our other blade reviews to find one that is. And if you have any questions, don’t hesitate to get in touch. What are you waiting for? Your life as a table tennis champion is only a click away!